At Maximum Wellness Rehab Physical Therapy in Toms River and South Plainfield, NJ, w​​e are your first line of defense to address any shoulder pain you may be experiencing. The shoulder is the body's most mobile joint. It's made up of nerves, ligaments, tendons, cartilage, muscle, tissue and bone. These elements allow the shoulder joint to rotate in a complete circle. Sadly, with so many parts, shoulder pain is a common problem. If you live or work in Toms River or South Plainfield, New Jersey and you suffer with shoulder pain, you do not have to turn to surgery or prescription and over-the-counter medications. You can get relief through gentle, safe, drug-free, non-addictive, non-invasive, chiropractic care. Chiropractors can use a wide range of simple, effective techniques to relieve swelling and discomfort and promote healing of all elements of the shoulder joint. They can use their hands and high-tech tools to adjust, align, reduce restriction and improve the function and mobility of the muscles, nerves, ligaments, tendons, tissue and more in the shoulder and eliminate shoulder pain. The treatments and therapies chiropractors offer provide a range of benefits. Before a chiropractor begins shoulder pain treatment, they do a thorough examination to identify the cause of the pain. 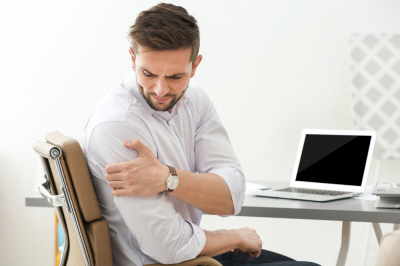 During the initial consultation, chiropractors use diagnostic tools like x-rays, CT scans and MRI machines to get a clear image of the part of the shoulder where the pain originates. Once they identify whether its a dislocation, strain, tear or irritation that is causing the shoulder pain, chiropractors use massage, nerve, muscle and tissue electrostimulation, joint adjustments, exercise, changes in posture and a host of other therapeutic methodologies to eliminate pain and promote healing. When shoulder pain is caused by misaligned or compressed joints, chiropractors can eliminate the pain by doing joint manipulation or adjustments. When chiropractors apply force in a safe, specific, controlled manner to a joint to help restore proper mobility and function that is called a joint adjustment. Accidents, falls, overexertion and stress can have a negative impact on the joint, muscles, ligament, tissue and nerves in the shoulder and lead to intense pain. Left untreated this can cause chronic problems and unending pain. Chiropractors can do adjustments that reduce or eliminate pain, get rid of inflammation and allow the shoulder to move freely without any discomfort. People with shoulder pain who live in Toms River or South Plainfield have an excellent non-surgical option when it comes to shoulder pain treatment. They can visit a chiropractor. Chiropractors have a wide range of non-surgical treatment methods that do not require medication, but can quickly relieve the pain, remove inflammation and help to heal your shoulder. It doesn't matter if the pain is caused by a misaligned shoulder joint or damage to the muscles, ligaments, tissue or nerves from auto accidents, a fall, trauma or sports injury, chiropractic care can help. Chiropractors can help people struggling with all types of shoulder pain to get relief and healing they never thought was possible. ​If you are suffering from shoulder pain, call Maximum Wellness Rehabilitation in Toms River or South Plainfieldtoday! (732) 818-1999 or click here​ to Book Your Appointment Today.